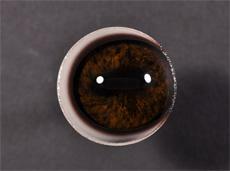 The World's First PRE-ROTATED Eye. Using our A-Spheric crystal, this eye was the first ever of its 3/4 exterior white band design. This series incorporates a ridge at the base of the eye so that you can make final adjustments using a brad or styling tool. This eye has been copied, but never truly duplicated. Our A-Spheric Pre-Rotated Eye is still hand painted by our talented artisans using a perfect blend of modern tools and old world techniques.